The lawsuit filed by 201 Democratic members of Congress challenging President Trump’s continued profits from foreign government guests at his hotels cleared a hurdle on Friday when a district judge rejected the Justice Department’s motion to dismiss the case. The ruling by U.S. District Judge for the District of Columbia Emmet Sullivan does not decide the merits of the complaint that Trump is violating the Constitution by retaining ownership of 500 hotels, golf courses and licensing projects, many frequented by foreign dignitaries. Instead, it sides with the lawmakers as potentially injured parties to pursue their complaint further. 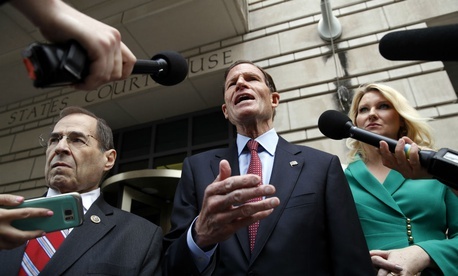 The suit, led by Sen. Richard Blumenthal, D-Conn., and Rep. Jerrold Nadler, D-N.Y., argued that each member of Congress “suffers a particularized and concrete injury when his or her vote is nullified by the president’s denial of the opportunity to vote on the record about whether to approve his” receipts of hotel or restaurant profits through the Trump Organization, from which businessman Trump did not divest himself when he assumed the presidency. The president, through the Justice Department, sought dismissal on the grounds the plaintiffs’ lacked jurisdiction and failed “to state a claim upon which relief can be granted,” among other reasons. “The president argues that this is an intra-branch dispute which does not belong in federal court because the plaintiffs’ remedy is to convince a majority of their colleagues in both houses to pass legislation addressing the president’s ability to accept prohibited foreign emoluments,” the judge noted. Friday’s victory for Trump’s critics follows a similar ruling in July in a Maryland District Court allowing a suit against Trump on similar issues brought by the attorneys general of Maryland and the District of Columbia. Trump’s continued ownership of his Washington luxury hotel has also brought suits by competing restaurateurs and the nonprofit transparency advocates American Oversight and Citizens for Responsibility and Ethics in Washington.